WE REPLIED: Liz I’m glad we could help with the issues at hand. When you are ready we’d be happy to help you make a decision on what to purchase, until then, Thank you for supporting small local businesses ! Happy Holidays.to you and your family. WE REPLIED: Thanks Julie, Glad we could help. Sometimes its hard to find parts, In the future we can ship also to save you some time. Happy Holidays! WE REPLIED: Thanks Lauren glad we can assist Hope you have a wonderful holiday season! WHAT THEY SAID: We’ve used this business multiple times and they are phenomenal!!! Incredibly nice couple, extremely knowledgeable with fast service. You don’t want to go anywhere else! WE REPLIED: Jean, Thanks for the great review. I’m glad we had the parts on site for you! Electrolux/Aerus is a very good workhorse of a Vacuum definitely worth keeping as long as you can fix it! WE REPLIED: Thanks Jason glad we could help feel free to call if you have any questions putting it in. WE REPLIED: Thanks Curt ! Glad we could help out Happy New Year! WE REPLIED: Thanks Joe, You didn’t need service in 19 years because you bought a product with quality and longevity. let us know if you need any other help. 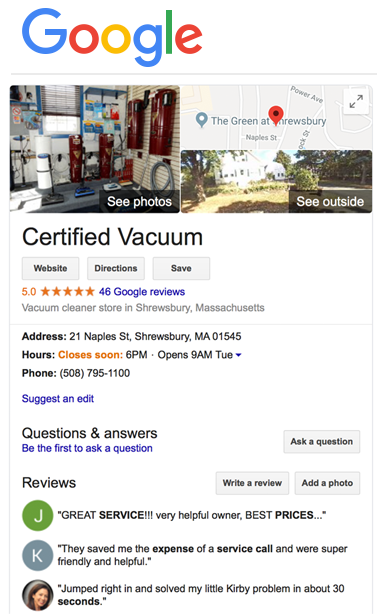 WE REPLIED: Jack thanks for the great review and thanks for letting people know to come in and try a vacuum out. With all the new carpeting out there it’s very difficult to see what vacuums work best . It was great working with you both and glad the sebo worked out for you. Feel free to call anytime with any questions . WE REPLIED: Thank you it was a pleasure working with you let us know if you need anything else we will be happy to help thank you. WE REPLIED: Thanks Jeff for having us back we really appreciate your support ! Let us know if we can help you with anything else in the future. WE REPLIED: Thank you , Your vacuum was definitely worth fixing glad it’s working again. I forgot we gave them balloons it’s always fun to see their faces with such a simple item to play with. Glad they had fun. WE REPLIED: Thank you it was a pleasure meeting you today glad we could help! WE REPLIED: Thank you Brian we appreciate your business if we can help you with anything else please don’t hesitate to call. WE REPLIED: Thank you we are glad everything went well feel free to call us for any other vacuum needs we certainly appreciate you support of small businesses! WE REPLIED: Thanks Linda we appreciate your business and the great review! WE REPLIED: Thanks! I’m so glad you’re happy with you’re new system . Retractable systems really cut down on time and space. Enjoy your home and once again Thank you for you’re business! WE REPLIED: Thank you Greg it was a pleasure working with you. Thank you for your business! WE REPLIED: We are happy we could assist you let us know if we can help you out at any time again. Thank you ! – Jay and Donna W.
WE REPLIED: Thanks Evan it was nice to meet you! WE REPLIED: Thank you for the great review. We try to educate people on what they are purchasing as well as helping them to make a decision on what is best for their household needs. It was a pleasure working with the Frutman’s. WE REPLIED: Thank you! It’s always a pleasure to educate and work with people. Today’s vac industry is much like any other… one of planned obsolescence so it is nice to let people know the values that are out there, and the difference in vacuums and what is inside them that makes them work. Please feel free to contact us anytime.